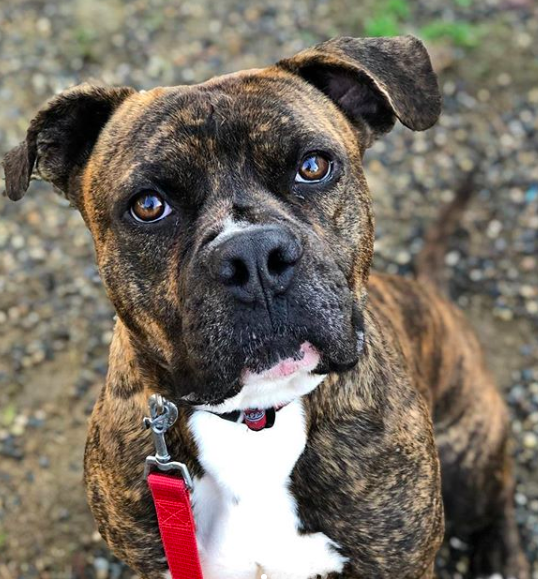 Meet 2 yr old Chomps, hes a boxer mix, medium sized and 100% adorable and friendly. Currently in foster with other dogs and doing great. He came to us from Fresno Humane and looking for his forever family. He's got the cutest face and a matching personality. He does fine with dog savvy cats, not destructive in the home and house trained. He struggles meeting dogs on leash but with a proper intro he's actual very friendly and playful. In the home he lets the other dogs take food out of his mouth. He does try to play with kitties but is easily corrected so dog savvy with supervision is a must if kitties around. Chomps' foster adore him and wanted to adopt, but its just not the right time for the family so he is offically available for adoption. They are fixed, vaccinated, and adoption includes being microchipped, current on flea/tick prevention meds and has been dewormed. They come with a collar, 2 free vet exams, a bag of grain free dog food, and a private training session with certified trainer, and more! adoption fee: $125. We accept Cash and Debit/Credit Cards. There is a 2.5% fee if using a card at the time of adoption. If interested in meeting this dog, please email: adopt@luckypawssite.org to request an application or come down to our public adoption event this Saturday 3/16 12:30-4pm at Petsmart in Eugene (2847 Chad drive) in the back of the store.